Hobby boxes make an ideal gift for any baseball card collector. They come at several price points, so no matter your budget, there's guaranteed to be something great for the baseball fan on your list. Unfortunately for many collectors, hobby shops aren't as plentiful as they used to be. 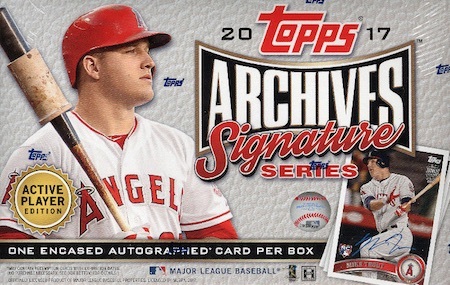 And while places like Walmart and Target have cards, the retail boxes sold there often don't normally have as many autographs or memorabilia cards. For most collectors, hobby boxes are definitely the way to go. Thanks to online shopping, finding the right set has never been easier. We've picked some great 2017 baseball card hobby boxes to give this season. Because most boxes can range in price from under $50 up to around $200, and even much higher, we've highlighted some for all budgets. Click on the listings to shop for boxes on eBay. The lowest Buy It Now price currently available is posted for each product. A simple way to compile the flagship Topps set, the 2017 Topps Baseball Complete Factory set features all 700 cards from Series 1 and 2. There are actually quite a few versions, some with exclusive parallels or inserts, that all run about the same price. 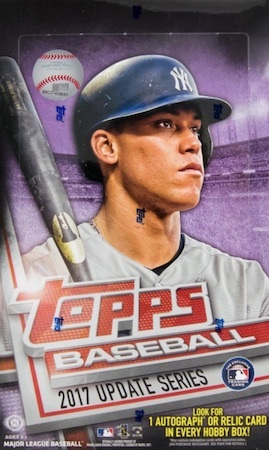 If you are looking for something a little more limited, Topps also sells exclusive flagship factory sets through their website. 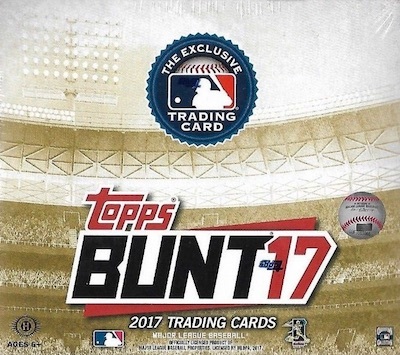 Generally, not much falls in at this price point but 2017 Topps Bunt is not your normal baseball set. Found in only one format, no hits are guaranteed, and autographs (and even numbered cards) are very tough to pull. What you do get is a fairly inexpensive product with some fun inserts. For a nice stocking stuffer or something good for a new collector, this is hard to beat. More like a one-card pack, 2017 Archives Signature Series: Active Player Edition has one random buyback autograph from a current player. The affordable gamble is a fun mix of excitement and possibilities. Plus, no matter what, you end up with an on-card autograph that is numbered and encased. There is also a Postseason Edition with retired players. Although you can easily get the first two series for flagship Topps in a factory set, the third set in the cardboard trilogy is a bit more elusive. Loaded with rookies, 2017 Update helps bring the brand up to speed on trades and call-ups, adding one autograph or relic per Hobby box. 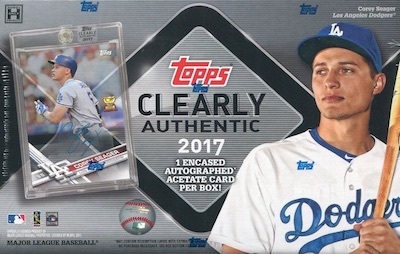 Like Archives Signature Series, 2017 Clearly Authentic is a one-card-per-pack release with a hard-signed autograph. However, these striking cards opt for acetate stock using the flagship design. Back for another year, 2017 Topps Stadium Club MLB scratches the collecting itch for 1990s nostalgia. Packed with great photography and two on-card autographs per box, this is another collecting favorite. 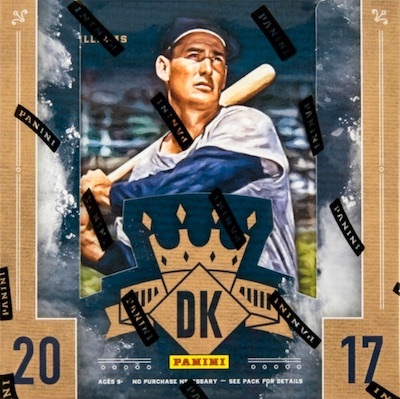 Featuring an artistic look, 2017 Diamond Kings brings two total autographs or relics per hobby box. Collectors also appreciate the checklist that mixes current stars, top rookies and all-time greats. 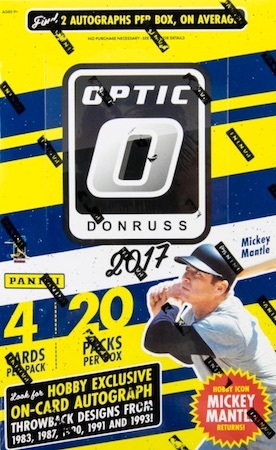 The shinier version of the main Donruss set, 2017 Donruss Optic is a popular chromium release from Panini. In the same vein as Topps Chrome, the set includes some on-card autographs and a ton of parallels. Adding to the appeal and value, every box delivers two signed cards. 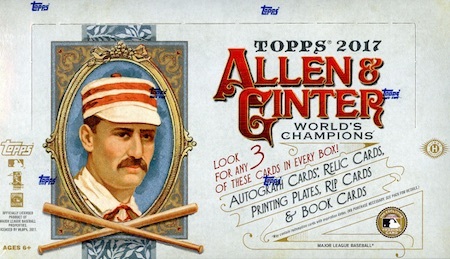 Since debuting in 2006, Allen & Ginter has become the hobby benchmark as far as variety goes. Baseball stars are freely interspersed with champions from other sports and endeavors. While the non-baseball signers aren't as strong as previous years, 2017 Topps Allen & Ginter Baseball includes a wide mix ranging from Gene Hackman to Floyd Mayweather Jr, plus the familiar MLB stars. Click on the listings to shop for boxes on eBay. 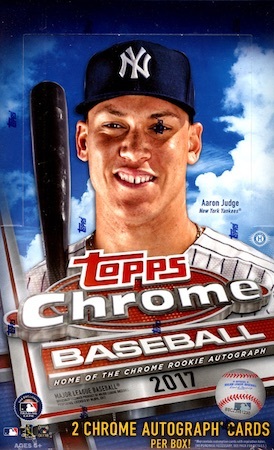 For some, nothing is better than a box of Topps Chrome under the tree. The well-known brand continues to earn considerable attention with the 2017 edition thanks to limited variations, many Refractors, and a strong rookie class. While Hobby boxes include two autographs, Jumbo bumps that to five signed cards. 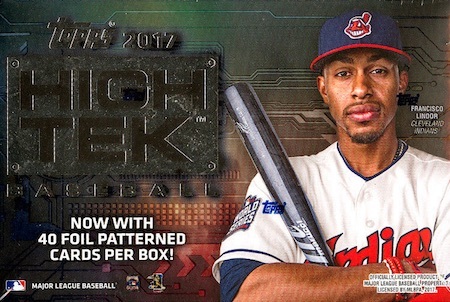 Even though the cards-per-box total increased a good amount, and there are now two autographs, 2017 Topps High Tek Baseball is still mostly about the acetate and patterns. There is also a Bowman version of High Tek with only prospects. 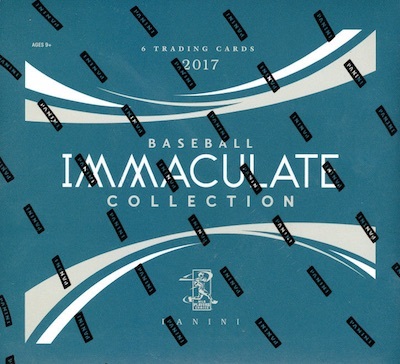 One of the top high-end brands of the last few years in several sports, baseball collectors also get in on the premium fun with 2017 Immaculate Baseball. Featuring five autograph or memorabilia cards per box, collectors can try their luck chasing signed rookie cards or one of many impressive relic cards. 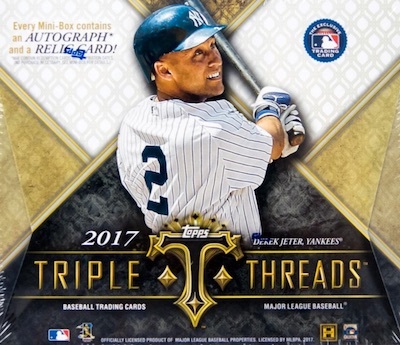 Built around big hits and relics that come in threes, 2017 Triple Threads Baseball has a distinct look that is immediately recognizable. Despite the higher price, the potential for something amazing is hard to question and each box includes two autographed relics and two additional relic cards. The format splits it into two mini boxes, each with two hits. 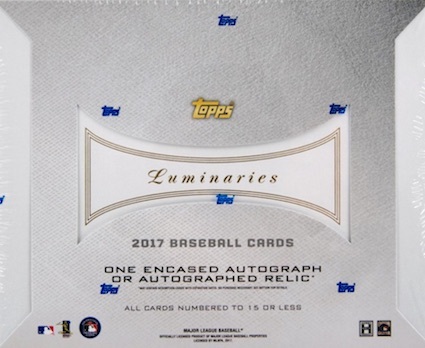 Another one-card-per-box format, 2017 Topps Luminaries is one of the newest high-end MLB sets. The low print runs and fairly tight signers list makes for an impressive result if you can handle the cost. There's also the fact that every box has a hard-signed card numbered to 15 copies or less. 2017 Topps Chrome Baseball Jumbo Hobby Box 5 Autos 🔥Aaron Judge Cody Bellinger? 2017 Topps Dynasty Factory Sealed Baseball Hobby Box Aaron Judge AUTO RC ??? 2017 Topps Chrome Baseball Factory Sealed HOBBY JUMBO Box-5 AUTOGRAPHS ! 2017 Topps Triple Threads Factory Sealed Baseball Hobby Box Aaron Judge RC ??? 2017 Topps Luminaries Factory Sealed Baseball Hobby Box Aaron Judge RC ??? Trey, I recently came across your website and really appreciate the info you provide. My eight year old son has started collecting baseball cards this year and is pretty passionate about it. He’s also an avid reader. Can you recommend a good guide to collecting cards? With so many options out there, it would be good for us to better understand the basics of being a collector as well as the terminology. I would appreciate your input. Thanks! Hey Dave, shoot me an email at trey at cardboardconnection.com and we can discuss.